When is a pressure relief valve (PRV) required on a fire pump system? For a standard 175 PSI rated system, the simple answer is check and make sure that your expected churn pressure plus maximum static suction pressure will not exceed 144.6 PSI (or 206.6 PSI for a 250 PSI rated system). The sizing of the relief valve comes from NFPA 20 (2010 edition) table 5.25(a) which is summarized in our fire pump sizing app. For those of you that like to know the details read on. 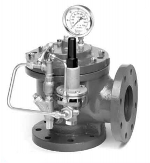 First let's clarify that we are taking about a main pressure relief valve and not a circulation relief valve. 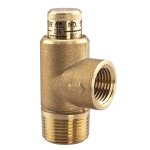 A circulation relief valve is generally 3/4-inch in size if less than 3,000 gpm and intended to provide a little fresh water into the pump casing for cooling purposes. When we say pressure relief valve in "fire pump" terminology, we are referencing a PRV that is only provided on diesel fire pumps to accommodate possible engine over-speed conditions. The regulators on diesel engines are good, but not perfect. When the load on the diesel engine changes,there is a natural delay in response and overshoot while the engine tries to maintain speed. Our goal is prevent the system from exceeding maximum rated system-pressures when this slight change in RPM occurs. By code diesel fire pumps have a kill switch should the RPM exceed ten-percent of the design speed. In practice, we have rarely seen a well maintained engine exceed 1.5% of the required speed when adjusting for loads. If we square the 10% increase in speed, we get a 21% increase in pressure as shown below. If we take 144.6 psi * 121%, we get 175 PSI. In practice, we do not recommend running your system this close to the rated system pressure unless you know there will never be any change to your suction pressure (i.e. a vertical turbine fire pump). For diesel fire pumps we recommend that you call and talk to one of our sales engineers. 4.18.1.1 Where a diesel engine fire pump is installed and where a total of 121 percent of the net rated shutoff (churn) pressure plus the maximum static suction pressure, adjusted for elevation, exceeds the pressure for which the system components are rated, a pressure relief valve shall be installed. 2.3.3.4 Provided a main relief valve on all diesel engine-driven fire pumps when 121% of the net rated shutoff (churn) pressure plus the maximum pump static suction pressure exceeds any system component rated pressure. FYI - Remember that utilizing a Pressure Relief Valve to reduce discharge pressures is not permitted by NFPA 20 section 4.7.7.2. Designing system to discharge large amounts of water every time it runs is not considered good design practice and code recognizes this fact.